North American Aviation, Ryan Aeronautical, Tusco Corp. The Ryan (originally North American) Navion is a United States single-engine, unpressurized, retractable gear, four-seat aircraft originally designed and built by North American Aviation in the 1940s. It was later built by Ryan Aeronautical Company and the Tubular Steel Corporation (TUSCO). The Navion was envisioned as an aircraft that would perfectly match the expected postwar boom in civilian aviation, since it was designed along the general lines of, and by the same company which produced the North American P-51 Mustang, generally regarded as one of the best Allied fighter aircraft. It has long served as FlightGear's default aircraft, until 2000, when the Cessna 172P took over that role. Over the years, the original LaRCSim FDM got lost. 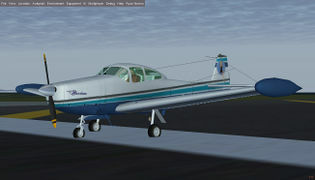 As of 2010, a new Navion is available for the current FlightGear releases. The Ryan Navion turned out to be a real pleasant surprise. Previously viewed thumbnails of the aircraft with a seemingly bulbous cabin did not do it justice. 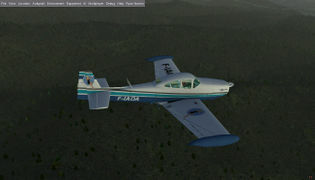 Running the Navion in FlightGear v3.0, I was confronted by a sporty-looking civil aircraft, with a nicely detailed cabin. The Navion seats four and is quite a faster cruiser, it seems. The plane handled quite well, as I recall, but I did not take notes. The visibility from the pilot's seat is something to remember, no central pillar to block the forward view, and the windscreen wraps around on each side. Adding creative military paint schemes should be interesting. Await a longer review and more images. See also Aircraft speed#V speeds. ↑ Ryan Navion. Published by Wikipedia. Retrieved 14 Okt 2015. ↑ AIRCRAFT SPECIFICATION NO. A-782 (pdf). Published by FAA, USA. Retrieved 14 Okt 2015. ↑ As the FDM references Wikipedia and both mention the Continental E185 engine, stated airspeeds match those of the Navion (L-17A) and Navion A (L-17B) model. This page was last modified on 15 July 2016, at 12:33.